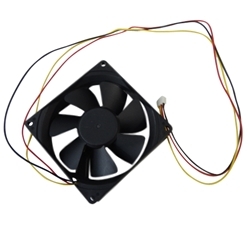 Description: New genuine Acer/Gateway computer replacement case cooling fan. The connector on this fan is 3 pin. This may be what you need if your fan stopped working or if your computer is overheating. Gateway One DX4300, DX4320, DX4350, DX4720, DX4820, DX4850, DX4860, FX6800, FX6802, FX6840, FX6860, LX6820.